Princeton’s Graduate College Dining Hall as it was likely set up during Feynman’s time there. A building on the Caltech campus. 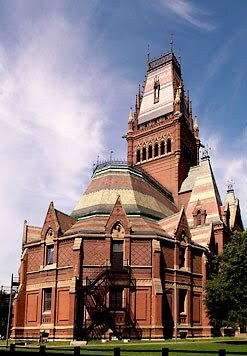 A building on Harvard University's Campus. This chapter takes place during Mr. Feynman’s time at Princeton University for his Graduate study. A majority of this chapter takes place in the Dining Hall at the Graduate College or other areas of Princeton where he has discussions with other students on fields other than Physics. It is here where he often discusses Biology and prepares to give his first series of talks. It begins with a book by Whitehead called Process and Reality which Feynman's peers were studying for a philosophy class seminar. In it was a discussion on essential objects which Feynman, in his usual style, tied out to science, particularly the electron. He took part in discussions and debated what the essence of an object is. These discussions prompted him to take part in discussions with students in other subjects of graduate study. Next stop, Biology. After discussions with peers in that subject, he took an interest in Biology. Some of the friends he made encouraged him to take a course, and he complied. It is here where the chapter title is mentioned. During the course, he studied a paper in which he needed to know about the locations of the muscles of a cat. He searched for a map of the anatomy of a cat and many thought that it was peculiar that he did so. He worked tirelessly on his studies to keep up with the graduate Biology students and he was able to manage well in the class and with the papers and problems that were assigned. From there, Feynman wished to study DNA and mutation of it. This required him to travel between Princeton University and Caltech. He soon found relationships between mutations and that they were caused by the lack of DNA bases. For further study, he visited Harvard University and was asked to give a seminar/lecture on his findings and studies of DNA. In this chapter Feynman learns the value of other subject areas and that he has the confidence to give lectures and seminars. He also learns that many students at Princeton just memorize instead of learning well enough to digest the information and apply it and from that, he works to truly understand what he is studying.